Teen girls have so much going on – friendship difficulties, social media upsets, body image worries and academic pressures. When these pressures build up, and girls don’t develop the strategies to handle them, it can lead girls to be distracted, withdrawn or anxious. Sadly, all too often, mental health problems can sometimes develop. In the Building Resilience after-school programme, girls are empowered to develop their skills and learn tools to better handle situations. Girls are supported to develop their own ideas and strategies to handle the pressures they face. Girls who have participated in the programme express themselves better in class and with their friends, have improved friendships, increased body confidence, higher aspirations and a more positive mindset to handle challenges. 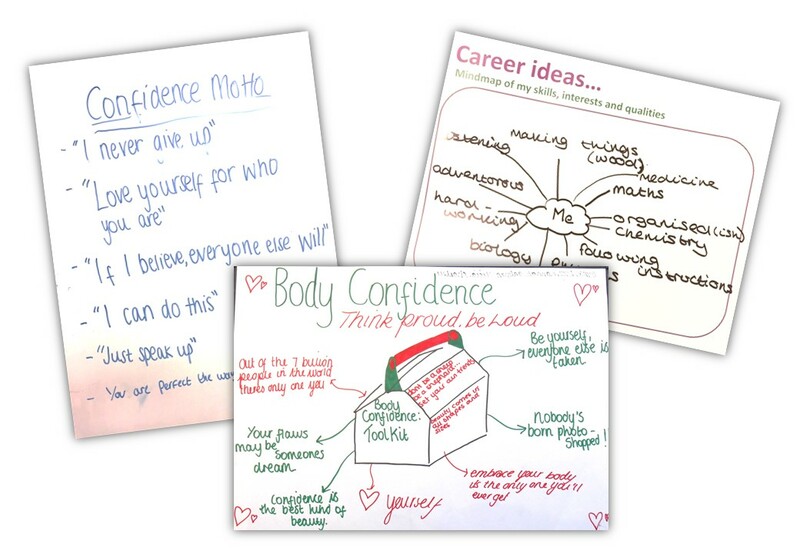 Confident Teens has designed the Building Resilience programme to focus on areas that teen girls worry about – by exploring these areas and sharing ideas girls find their own approaches to handle the pressures. Fundamental to the programme is increasing self-awareness – the cornerstone of confidence and resilience. Girls are encouraged to self-reflect and consider how they respond to situations. Between sessions they are encourages to practise the skills they learn, to progress their personal development. No one is ever put on the spot – it’s always a fun and supportive atmosphere! As well as varied resources in the sessions, every student has her own four-page workbook in every workshop, to use for self-reflection and keep afterwards (a series of six in all). These resources can also be helpful for parents and carers to support their daughters. Building girls’ self-belief and pride in their own individuality. Building skills and confidence to contribute positively in class, speak to others in a range of situations, and present themselves well. Encouraging the girls to be ambitious for their futures, be inspired by role models and consider different careers. Developing girls’ awareness of media messages about bodies, and supporting them to have confidence in their changing bodies. Supporting girls to be resilient and assertive in their relationships with their family, friends and boys. Celebrating their talents and abilities, and giving girls an opportunity to reflect back what they have learnt through the programme. This six-week programme for Years 7, 8 and 9 girls has a proven track record in schools and academies, receiving excellent feedback from students, teachers and parents. At the end of the programme every girl is awarded a certificate to mark their completion of the programme. Measuring impact and providing evidence is integral to the programme, including students’ written feedback of their experience. These findings are compiled into a report for the school, alongside examples of output from the sessions. Or use our contact form to send us your email address and we’ll be in touch with further details so we can discuss the needs of your students and school. We look forward to empowering your teen girls to develop their ideas and strategies for handling the pressures they face, and so building their confidence and resilience. Confident Teens is proud to partner with Herts for Learning, a leading education company operating with a not-for-profit ethos, to offer this Building Resilience programme to schools in Hertfordshire. Contact us to find out more.